The above info came from aliwengler, and was edited by yours truly (contact me). The image came from Wikipedia. 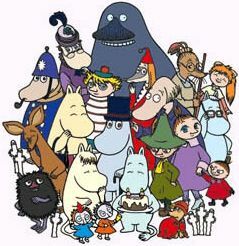 Moomin is an anime created by both Japanese and European companies, based on a series of children's books by Finnish author Tove Jansson. Although there have been several TV adaptations of the books, the anime version is the most recognized. It mainly tells us about the adventures of Moomintroll, a young Moomin who lives with his parents, Moominmamma and Moominpappa. Together with his friends, Sniff, Snufkin, Little My and Snork Maiden, Moomintroll spends most of his days exploring Moomin Valley, uncovering hidden truths and meeting unusual beings and mysterious spirits. The above description came from aliwengler, and was edited by yours truly (contact me).